1. Heat seal Ribbon edges. Pass Ribbon edge through the flame in quick movement. 2. Fold 1st Ribbon. 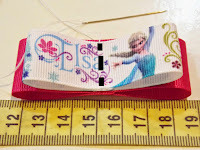 Make sure the ends overlap with enough space to sew in the centre. Clip it to hold it down. 3. Fold 2nd Ribbon the same way. 4. Arrange and sew Ribbons together. 5. This is what the back looks like. 6. Pinch the Ribbon into 'M' and pull thread tightly. 7. Wrap thread around Bow 3-4 times. Pass needle through Bow and make a knot. 9. Another method to steps 4,5,6 is pinch Ribbon to 'M'. Find the centre of Ribbon and pull needle through. Continue with step 7 and 8. Now you can use these cute bows for hairclips, broochs, bookmarks, appliques.